‘Hang Ya Boss Out To Dry’ Is Starting to Heat Up! 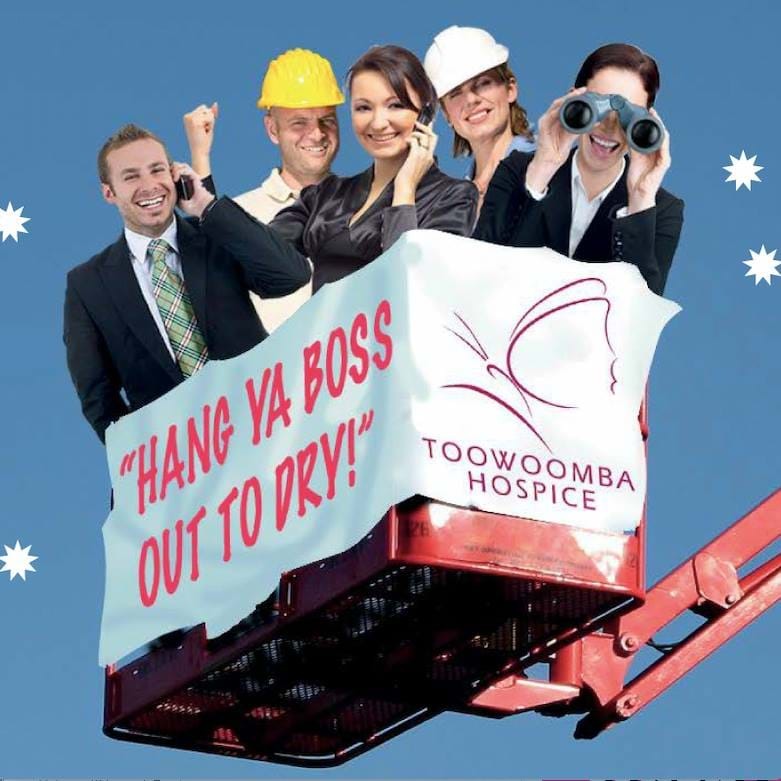 Things are starting the heat up for this Friday’s annual ‘Hang Ya Boss Out To Dry’ in aid of the Toowoomba Hospice. While there are already 15 bosses and CEOs registered for this year’s event there’s still time for you to nominate your boss to Hang Out to Dry on Friday 5th April – and it’s all for a good cause The Toowoomba Hospice. "I am delighted with the result of bosses and CEOs at this stage but there is still room for more. We are asking businesses to ‘hang their boss out to dry'. It’s simple, your boss is placed in a scissor lift/cherry picker and then raised to the top – and left there until fearless leader raises a minimum of $3,000 only to set foot on solid ground again once the minimum has been raised. They can contact anyone they like to raise their money, so hopefully no-one will be left hanging! This year the target is $60,000 and as an incentive, the boss who raises the most money gets to host the 2020 fundraiser at their work place PLUS all those who are hung out to dry go into a draw to win a high quality Baby Q Weber donated by Toowoomba BBQ’s & Fireplaces in the Bernoth Centre! 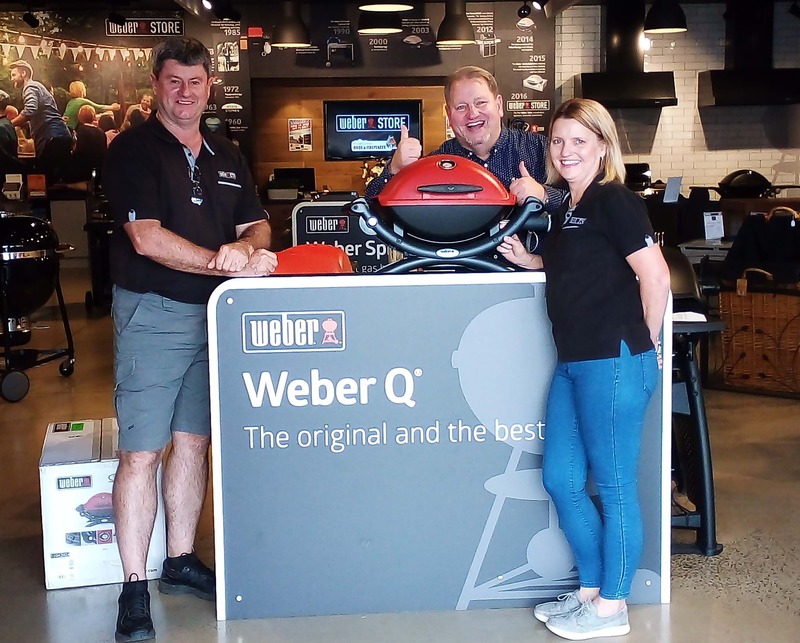 Michael and Lyndell Kelly the business owners of Toowoomba BBQ’s and Fireplaces proudly showed off the Baby Q Weber which will be given to one of the bosses who gets hung out to dry this Friday to Hospice’s Mark Munro! In addition, to top off this great event, your favourite breakfast show host, Triple M’s Lee Faulkner will broadcast live from the event. Abbey’s Cottage Café will be selling Breakfast Burgers and Coffee with proceeds going back to the Hospice. Mr Munro said you can be guaranteed that your time and money will be going to a great cause.